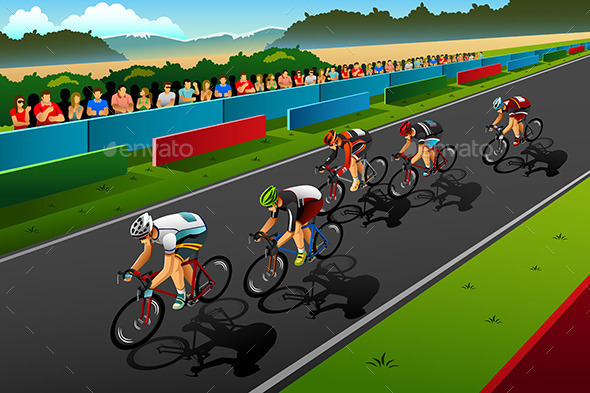 A vector illustration of people cycling in the competition for sport competition series. Vector illustration, zip archive contain eps 10 and high resolution jpeg. Happy Girl Carrying Christmas Presents in the Snow; Man Flying Drone in a Park Illustration; Senior Man Reading a Book in the Library; Couple Snowboarding at a Winter Resort; Empty Office Workplace Illustration; Family Having Christmas Dinner Together Illustration; Winter Village With People Cars and Buildings Illustration. Keywords: adult, athlete, audience, bicycle, biking, cartoon, clip-art, clipart, competition, cycling, exercise, fit, fitness, health, healthy, illustration, leisure, lifestyle, male, man, modern, people, playing, racing, sport, stadium, tournament, vector, workout, young.